Steele Creek’s Berewick is a rapidly growing community that offers something for everyone in the way of housing and amenities. The sprawling master-planned community inhabits what was formerly a quiet area of Charlotte, where the city expanded into nature near the shores of Lake Wylie. Pappas Brothers, the company that developed Berewick, has been working on and expanding the property since 1999. Proximity to major interstates (I-485 is 2 miles away), uptown Charlotte and Charlotte Douglas International Airport, make Berewick a perfect blend of suburban with urban amenities. The development’s Berewick Town Center, located along Steele Creek Road between Dixie River Road and Shopton Road West, offers shopping and dining. Harris Teeter and Walgreen’s anchor the town center. Residents also have access to nearby Ayrsley Town Center and Rivergate, which also offer great restaurants, shops and entertainment. With I-77 and I-85 accessible from 485, all of Charlotte’s major shopping and attractions are only minutes away! Berewick comprises more than 2,000 single-family homes, townhomes and apartment living. There are 3 separate apartment living options, which will have 230 apartment homes (Fall 2019). The development also includes 108 senior-living apartments (Fall 2019). Builders for Berewick are Mattamy Homes and Gordon Builders. 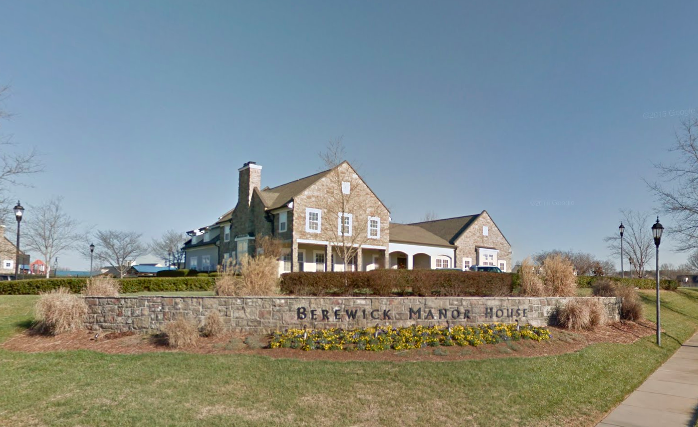 Residents in Berewick have access to a full list of amenities including a pool, children’s splash pool, fitness facility, and the community’s 5,200 square-foot- Manor House that offers a catering kitchen and space for gathering. The community’s activities director keeps an active community calendar for residents, including seasonal events annually. There is more than 300 acres of green space and numerous walking trails throughout the community. Access to a Lake Wylie public boat ramp is also only 10 minutes away for a day of fun and fishing on the lake. Nearby Berewick Regional Park also offers athletic fields, green space, walking trails and a playground. Children living in Berewick attend Berewick Elementary Schools, Kennedy Middle Schools and Olympic Community of Schools. In addition, the Charlotte area offers a host of options for private education at all ages. Single-family homes in Berewick range in size, price and age. Some of the older homes in Berewick were built in the early 2000s. There are newer homes as well, built in 2015 and later. Most of the homes are two stories with brick or stone veneer and vinyl siding. Homes range in size from low 2,000s in square feet to more than 4,000 square feet in size. Sold prices in Berewick have ranged from $234,000 to $421,000 during the last 12 months, and an average of 14.1 homes sold per month during the same period. The average price per square foot for homes sold was just under $107. As of Dec. 3, 2018, there are 34 resale homes on the market with list prices ranging from $249,000 to $399,900. The average percentage of list price received is 98.8 percent.